With regard to company executive boards, which does not come under this law, female participation continues to be much lower. 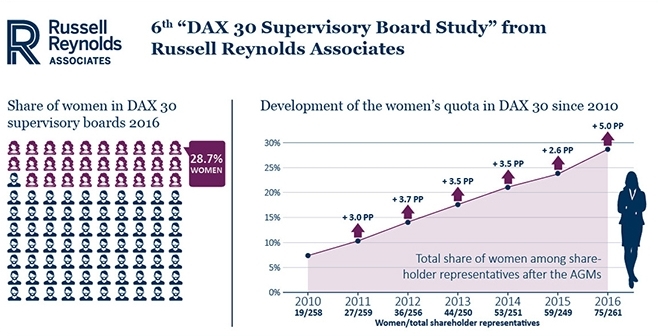 According to the AllBright Foundation, female board representation across the DAX companies stands at roughly 12% as compared with 14.5% in France, 24.1% in Sweden, and 24.8% in the United States. Further information can be found, among others, here (in German). The voting was preceded by years of public debate and was nevertheless controversial: some found the quota too low, while others, found the '[f]emale quotas represent an important notch on the belt of property rights' (The Head of the Rhineland regional federation office, Mr. Thomas Rick who did not exclude filing a complaint with the Constitutional Federal Tribunal on behalf of some the Federation’s members). The vote on the act was nevertheless denoted 'a historic step' by the Minister for Families, the Elderly, and Women, Manuela Schwesig in her opening speech of the parliamentary debate. She also added that 'After gaining access to political power, women have finally gained access to their fair share of economic power (...)'.The Minister was not alone in her enthusiasm and was backed by a similar voice from the Social Democrat Minister for Justice, Heiko Maas who declared the act to be the most important in terms of gender equality since the 1918 female suffrage law. At the same time the Ministry is also reported to be working on another law addressing existing gender related salary gaps (that are currently reported to be 22% under the male equivalents).